Show other documents from Apple.com TIP: Try comparing two versions that are closer to one another. When they're too far apart, the comparison may become unreadable depending on how many changes were made. May 24, 2018 Several changes including some new sections. Jan 20, 2018 The "Privacy Questions" section has been updated. Dec 17, 2017 Changes under "Privacy Questions". Sep 19, 2017 Changes under "International Users". Sep 12, 2016 Sections updated: "Collection and Use of Non-Personal Information", "Cookies and Other Technologies", "Third?Party Sites and Services", and "International Users"; Other terminology changes. May 31, 2016 The conditions in which you may opt out of "Limit Ad Tracking" have been updated in the "Cookies and Other Technologies" section; The "Children & Education" section has been heavily modified; Sentence removed concerning withdrawing consent in the "Location-Based Services" section. This version has been updated silently, without a change to the posted "last modified" date. This means that without ParanoidPaul, you wouldn't have known the document was updated! The date displayed for this row is when ParanoidPaul detected the change. Mar 19, 2015 The summary of what changed back in September has been removed from the top. The link to opt out of interest-based ads from iAd has also been removed. This version has been updated silently, without a change to the posted "last modified" date. This means that without ParanoidPaul, you wouldn't have known the document was updated! The date displayed for this row is when ParanoidPaul detected the change. Dec 23, 2014 A new link has been added at the bottom of the page that allows you to opt out of interest-based ads from iAd. 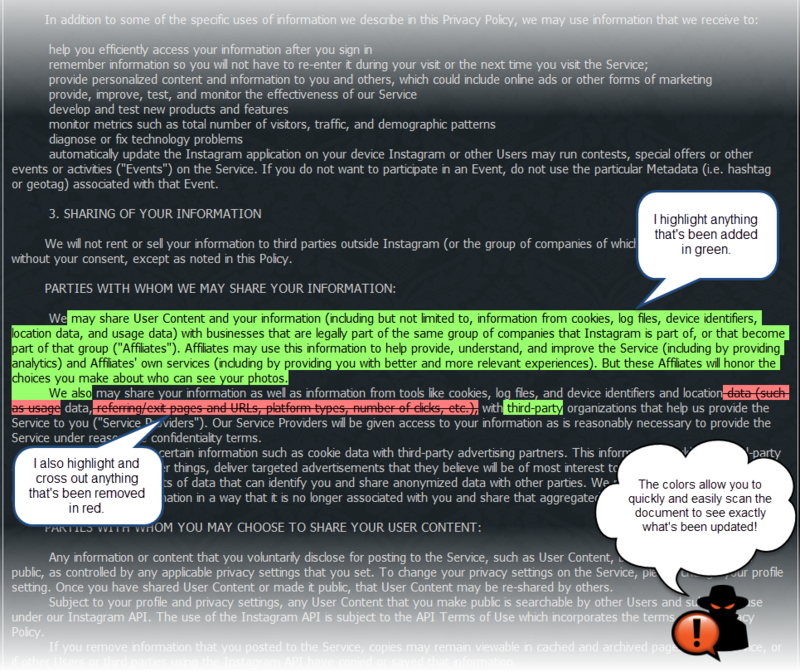 Opt out here; Paragraph concerning TRUSTe Privacy Seal removed but the TRUSTe icon is present. Sep 17, 2014 "The changes were made predominantly to cover new features that will be released with iOS 8 or to provide additional information on current data use such as date of birth and third party user data provided by our users(...)"
Mar 1, 2014 This is the initial version that ParanoidPaul captured. It is not necessarily the first version of the document. Personal information is data that can be used to identify or contact a single person. When you create an Apple ID, apply for commercial credit, purchase a product, download a software update, register for a class at an Apple Retail Store, contact us or participate in an online survey, we may collect a variety of information, including your name, mailing address, phone number, email address, contact preferences, and credit card information. The personal information we collect allows us to keep you posted on Apple’s latest product announcements, software updates, and upcoming events. If you don’t want to be on our mailing list, you can opt out anytime by updating your preferences. From time to time, we may use your personal information to send important notices, such as communications about purchases and changes to our terms, conditions, and policies. Because this information is important to your interaction with Apple, you may not opt out of receiving these communications. We may collect and store details of how you use our services, including search queries. This information may be used to improve the relevancy of results provided by our services. Except in limited instances to ensure quality of our services over the Internet, such information will not be associated with your IP address. Ads that are delivered by Apple’s advertising platform may appear in Apple News and in the App Store. If you do not wish to receive ads targeted to your interests from Apple's advertising platform, you can choose to enable Limit Ad Tracking, which will opt your Apple ID out of receiving such ads regardless of what device you are using. If you enable Limit Ad Tracking on your mobile device, third-party apps cannot use the Advertising Identifier, a non-personal device identifier, to serve you targeted ads. You may still see ads in the App Store or News based on context like your search query or the channel you are reading. In third-party apps, you may see ads based on other information. As is true of most internet services, we gather some information automatically and store it in log files. This information includes Internet Protocol (IP) addresses, browser type and language, Internet service provider (ISP), referring and exit websites and applications, operating system, date/time stamp, and clickstream data. We use this information to understand and analyze trends, to administer the site, to learn about user behavior on the site, to improve our product and services, and to gather demographic information about our user base as a whole. Apple may use this information in our marketing and advertising services. In some of our email messages, we use a “click-through URL” linked to content on the Apple website. When customers click one of these URLs, they pass through a separate web server before arriving at the destination page on our website. We track this click-through data to help us determine interest in particular topics and measure the effectiveness of our customer communications. If you prefer not to be tracked in this way, you should not click text or graphic links in the email messages. At times Apple may make certain personal information available to strategic partners that work with Apple to provide products and services, or that help Apple market to customers. For example, when you purchase and activate your iPhone, you authorize Apple and your carrier to exchange the information you provide during the activation process to carry out service. If you are approved for service, your account will be governed by Apple and your carrier’s respective privacy policies. Personal information will only be shared by Apple to provide or improve our products, services and advertising; it will not be shared with third parties for their marketing purposes. It may be necessary − by law, legal process, litigation, and/or requests from public and governmental authorities within or outside your country of residence − for Apple to disclose your personal information. We may also disclose information about you if we determine that for purposes of national security, law enforcement, or other issues of public importance, disclosure is necessary or appropriate. Apple takes the security of your personal information very seriously. Apple online services such as the Apple Online Store and iTunes Store protect your personal information during transit using encryption such as Transport Layer Security (TLS). When your personal data is stored by Apple, we use computer systems with limited access housed in facilities using physical security measures. iCloud data is stored in encrypted form including when we utilize third-party storage. You can help ensure that your contact information and preferences are accurate, complete, and up to date by logging in to your account at https://appleid.apple.com/. For other personal information we hold, we will provide you with access for any purpose including to request that we correct the data if it is inaccurate or delete the data if Apple is not required to retain it by law or for legitimate business purposes. We may decline to process requests that are frivolous/vexatious, jeopardize the privacy of others, are extremely impractical, or for which access is not otherwise required by local law. Access, correction, or deletion requests can be made through the regional Privacy Contact Form. If at any time a parent needs to access, correct, or delete data associated with their Family Sharing account or child’s Apple ID, they may contact us through our Privacy Contact Form. To provide location-based services on Apple products, Apple and our partners and licensees may collect, use, and share precise location data, including the real-time geographic location of your Apple computer or device. Where available, location-based services may use GPS, Bluetooth, and your IP Address, along with crowd-sourced Wi-Fi hotspot and cell tower locations, and other technologies to determine your devices’ approximate location. Unless you provide consent, this location data is collected anonymously in a form that does not personally identify you and is used by Apple and our partners and licensees to provide and improve location-based products and services. For example, your device may share its geographic location with application providers when you opt in to their location services. Some location-based services offered by Apple, such as the “Find My iPhone” feature, require your personal information for the feature to work. If you'd like to be notified when Apple.com makes updates to documents like this, choose which ones you'd like to subscribe to today (it's free! ).